Charlton Hinman. THE PRINTING AND PROOF-READING OF THE FIRST FOLIO OF SHAKESPEARE. Oxford: At The Clarendon Press, 1963. 2 vols. xvi 507  + vii 560 p. Errata slip in vol. 1. as issued. Frontis. in each vol., plates, illus. Large 8vo. Blue cloth, spine stamped in gilt. Charlton Hinman’s own set with his annotations on approximately 100 pages. Laid in are four sheets and ten notecard slips of autograph notes regarding corrections and emendations, citations to other research, and miscellaneous information including a list of people to receive complimentary copies and a brief outline of major references of analytical bibliography. Also laid in are thirteen pages of correspondence dated mainly 1964-1965, including six TLs’s with Hinman’s carbon TL replies. Correspondents include Prof. S.F. Johnson of Columbia University, Akihiro Yamada of Shinshu University, Dr. J. Shafer of the Westfalische Wilhelms-Universitat, Arthur Humphrey of the University of Leicester, and Giles Dawson of the Folger Library. Dawson, the curator of books and manuscripts at the Folger, was instrumental in assisting Hinman with his work. All but Dawson’s letter deal primarily with errata found in the book by the various correspondents. Dawson’s three-page TLs concerns Staunton’s photolithographic facsimile of the First Folio published in 1866 as well as personal news. One of the monumental works in the history of bibliography, and the greatest achievement in the field of analytical bibliography. 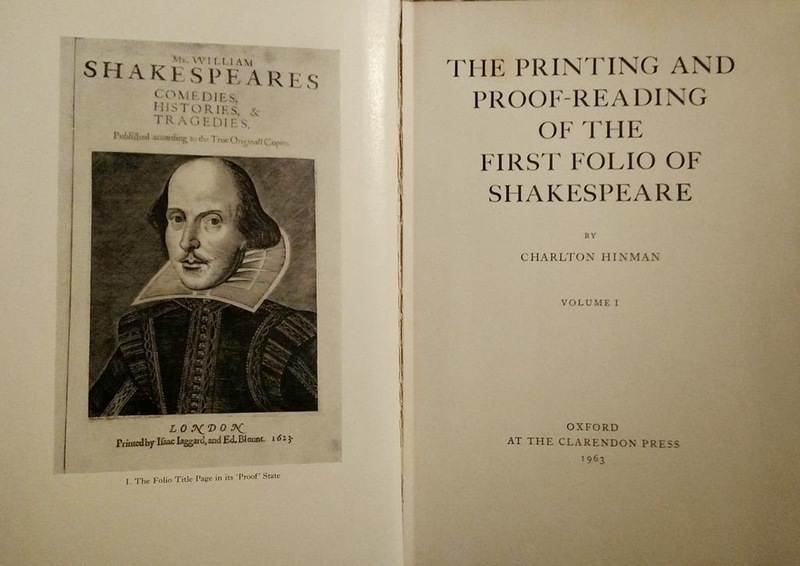 Hinman, using a collation machine designed by himself and inspired by his service in WWII intelligence, did a page-by-page comparison of over fifty copies of the First Folio at the Folger Library. The results published here changed not only the entire nature of Shakespearian scholarship but also heavily influenced the general course of bibliographical studies.